(CNN) -- Six Nations champions Wales have been boosted by the availability of several key players ahead of next week's floodlit clash against France at the Stade de France in Paris. 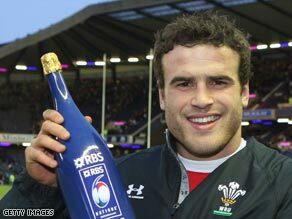 Roberts was man of the match against Scotland but suffered an injury scare last weekend. Their major concern for the Friday February 27 showdown focused on center Jamie Roberts, who had a scan on his shoulder following the 23-15 win over England last Saturday. "Jamie had some soreness after the game on Saturday and so we took steps to ascertain the extent of the damage to his shoulder if any," team physio Mark Davies told Press Association. "Specialists have determined that the shoulder is in a stable condition and so there is no reason why he should be prevented from being in contention for the game against France." Roberts could form a center pairing with Ospreys star Gavin Henson, who is recovering from a calf injury which forced him out of the wins over Scotland and England. Coach Warren Gatland has been hoping to pair the two since the autumn internationals as his team step up their bid for successive grand slams. Flying winger Shane Williams, who missed the nail biting win over England, is also expected to be ready after an ankle injury. Wales will be faced by a French side including recalled Stade Francais prop Sylvain Marconnet. He replaces Nicolas Mas, who picked up a hamstring injury in the 22-13 victory against Scotland last weekend. Marconnet, who has 71 caps, a record for a French prop, last played for his country against Wales two years ago. He broke a leg in a skiing accident that saw him miss the rest of that year's Six Nations and also the World Cup. "He is back in form and can bring us his experience," said coach Marc Lievremont. "He has strung a lot of matches together and has a lot of enthusiasm. His return was expected." Lievremont also called up Clermont prop Thomas Domingo in place of Renaud Boyoud. Wales and Ireland lead the Six Nations standings with two wins apiece, but France, who lost narrowly lost to the Irish in their opener, can revive their title hopes with a win against Gatland's men at the Stade de France.